You never forget your first Polecat. It’s a bit like riding a bike in that sense. Mine was perched atop a telegraph pole along a back lane in deepest Shropshire when I was knee-high to our most charismatic Mustelid. My dad pointed it out as we drove to the local garage to stock up on snacks to consume whilst watching the late-night American Football. It was January 1987 and the legendary Denver Broncos quarterback John Elway was orchestrating one of the greatest comebacks in sporting history against the Cleveland Browns. Around this time, a similar recovery was being seen by one of our once most familiar mammals, the Polecat. Here, just 12 miles or so from the West Midlands conurbation, Polecats were bouncing back. Over the previous ten or so years my dad had seen them every so often when out at night, but now we were encountering them with increasing frequency. Polecats had been suffering at the hands of people for centuries. Ever since the introduction of the infamous ‘Act for the Preservation of Grayne (sic)’ in 1566 declared, well, basically everything, as vermin, Polecats had been having a tough time. Yalden (1999) notes “The Act encouraged the extermination of vermin by allowing church wardens to pay a bounty on the corpses. For Arksey in Yorkshire…the take between 1720 and 1769 of 425 Polecats.” When you consider the number of Stoats (that may have also included Weasels) was similar, it’s clear how commonplace Polecat once was. The introduction of the gin trap to the armoury of a high density gamekeeper population was also disastrous, and whilst the Polecat was still present in most counties in 1850, it started to disappear from southern counties during the following decades. The rate of decline in the latter part of the 19th Century is quite shocking and by 1915 it was clinging on only in remote corners of the UK, where gamekeeping pressure was lowest, including west Sutherland, a coastal strip in Cumberland and in central/west Wales. It may have also clung on in the Marches (western parts of Herefordshire and Shropshire particularly) and Yorkshire at this time but there is confusion over misidentifications and limited reliable documentation. Polecat near Foel, mid-Wales from BiOME on Vimeo. A total of 1,761 records of Polecats and Polecat-Ferrets were collected from mainland Britain from January 2014 to December 2015. Of these, 42% were verifiable (on the basis of photos or video footage, 74% were classified as true Polecat, 25% were classified as Polecat-Ferret and 1% were classified as Ferrets, based on phenotypic characteristics. 50% of records received were road casualties, 36% were live sightings, 5% were animals caught alive in traps, 4% were animals found dead and not obvious road casualties, 4% were animals recorded on camera traps and <1% were from an unspecified or other source. Verifiable records of true Polecats were received from 370 hectads (10km x 10km squares) in Britain. Verifiable records of Polecat-Ferrets were received from 145 hectads. Verifiable records of true Polecats were received from several vice counties where true Polecats have not been recorded in previous distribution surveys; these are South Somerset, North Devon, South Devon, East Cornwall, East Kent, East Suffolk, West Norfolk, Cambridgeshire, South Lincolnshire, South Lancashire, South-west Yorkshire, North-west Yorkshire, South Northumberland, Dumfriesshire and Angus. Polecats are maintaining their range in their historical stronghold of Wales and the West Midlands. The Polecat’s range has expanded considerably in southwest England and East Anglia. There has been little change in Polecat distribution in much of northern England, although the Polecat population in Cumbria is expanding into parts of western Northumberland and a population appears to be present in the eastern Yorkshire Dales. There has been little change in polecat distribution in Scotland. 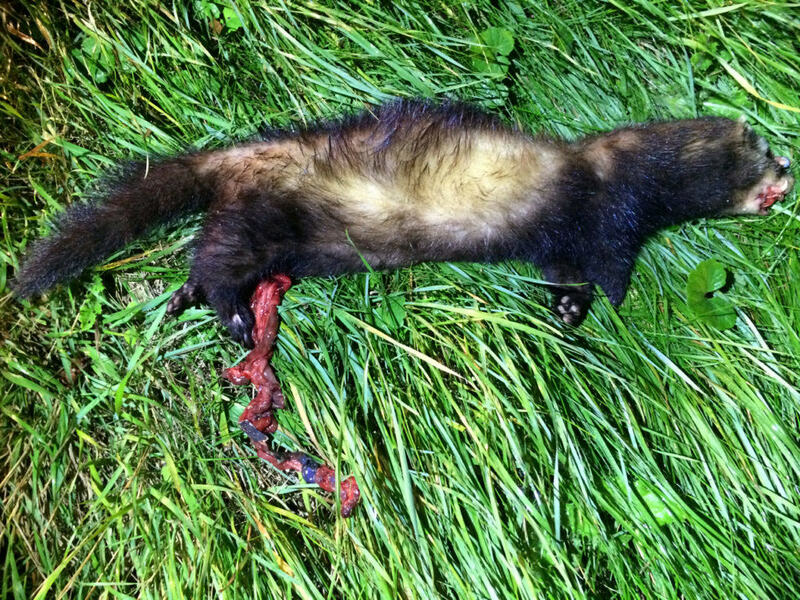 Polecats appear to be re-colonising Dumfriesshire and the reintroduced population in Perthshire and Angus remains established. Polecats are now more widespread in Britain than at any time in the last 100 years. 266 carcasses were collected for research. 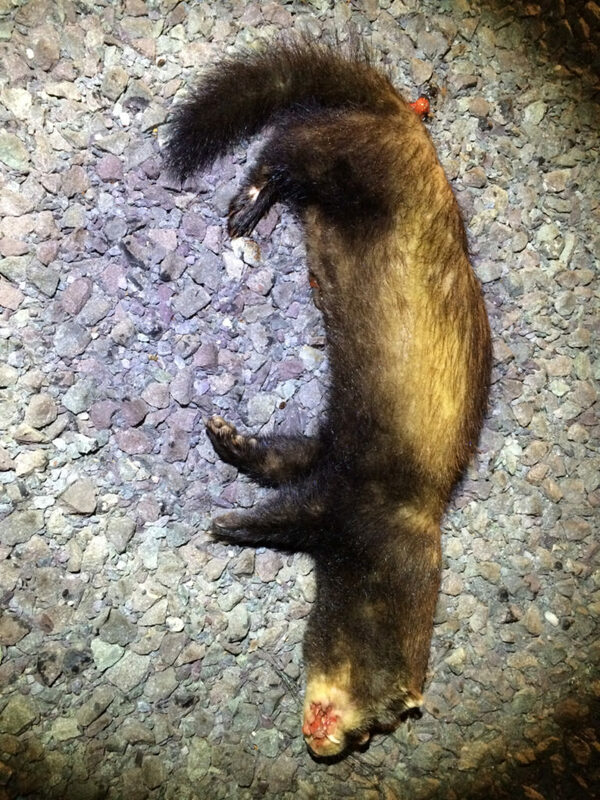 Carcasses will be used to investigate anthropogenic hazards to Polecats, such as exposure to rodenticides and subsequent secondary poisoning. This became a bit of a pet-project of mine. As there were no previous documented records of this species from my home county, Norfolk, I was very keen to find the first! I set up camera traps in likely locations around Thetford Forest and wider Breckland, their most probable entry point into the county given recent records in nearby Cambridgeshire. East Wretham Heath, a Norfolk Wildlife Trust Reserve, was targeted due to its large population of Rabbits. Whilst Rabbits are certainly a favoured prey in Britain they have a varied diet and have been observed catching Eels, while amphibians are also readily consumed (a den of one female Polecat in Wales was once found to contain forty large frogs and two toads, sprawling and still fresh having been bitten through the brain by their captor). Troublingly, the warden at East Wretham Heath had warned me that this was a favoured release site for unwanted Ferrets and I had recorded such beasts nearby during nocturnal Stone-Curlew surveys over the previous couple of years. In the end, I never captured a Polecat, or lookalike, on camera, either at East Wretham Heath or at other sites in the area. Nevertheless, I did document a number of road traffic accidents (RTAs) during the two years, carcasses of which were sent off for analysis. Whilst a number were confirmed to be hybrids, ferrets or were in too poor a condition to tell what they were with any degree of confidence, two specimens met the judge’s approval, including the first ever to be recorded in Norfolk, a RTA found near Little Dunham on 10th September 2014. The second soon followed when I found a freshly dead male on the road not far from, you’ve guessed it, East Wretham Heath at 04.35am on 1st October 2014 (during a day when I saw 26 species of mammals in the county, not including Polecat!). So, a dream came true, finding the first record of a mammal species in my home county! I couldn’t have been happier, and the future for this terrific mammal looks brighter than it has done so for a long time! I used to manage a range in Thetford Forest, Norfolk and had great views of a Polecat on 2 occasions in 2010 and again in 2011, a great place to live if you love wildlife. I surveyed for Polecats with CCW in the late 90s in Wales, they are a great species. I had 2 excellent views of a Polecat in an area of Thetford Forest I used to manage in 2010 and in 2011, I also had good populations in Bicester in 2004-07 seen by quite a few people and through roadkill specimens, via the Conservation Group I chaired there.